All lanes of eastbound state Highway 84 on the Dumbarton Bridge are currently blocked due to a jack-knifed big rig early Tuesday morning, according to the California Highway Patrol. Mike Inouye reports. 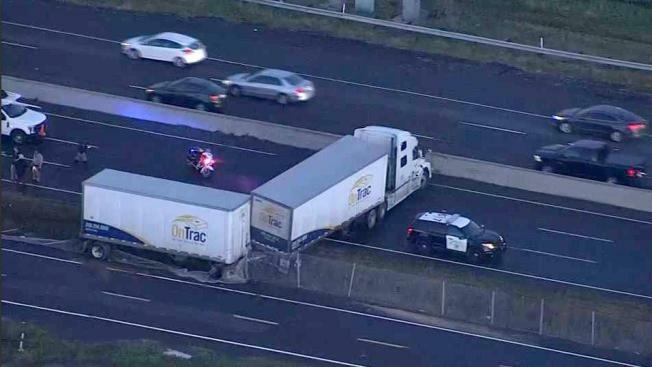 All eastbound lanes of state Highway 84 on the Dumbarton Bridge have reopened after a jackknifed big-rig blocked them for more than two hours Tuesday morning, according to the California Highway Patrol. The solo-vehicle crash was reported at 5:38 a.m. just west of Thornton Avenue. All lanes reopened by about 8:15 a.m., CHP officials said. No injuries were reported in the crash.